The odometer read 25,166 miles after a year with this 2013 Nissan Altima 3.5 SL, but we already understood what it was all about at 491 miles, when we first topped up the fuel tank. As Laura Sky Brown, executive editor of JeanKnowsCars.com, started down the freeway with her teenage daughter to Indiana University some 320 miles away, she noted of the Altima, “It is comfortable without being too cushy or pretentious, fast without being intimidating to the normal driver, and attractive without being ostentatious in any way. Yet it’s not a boring car at all.” Really, sometimes it’s so obvious. 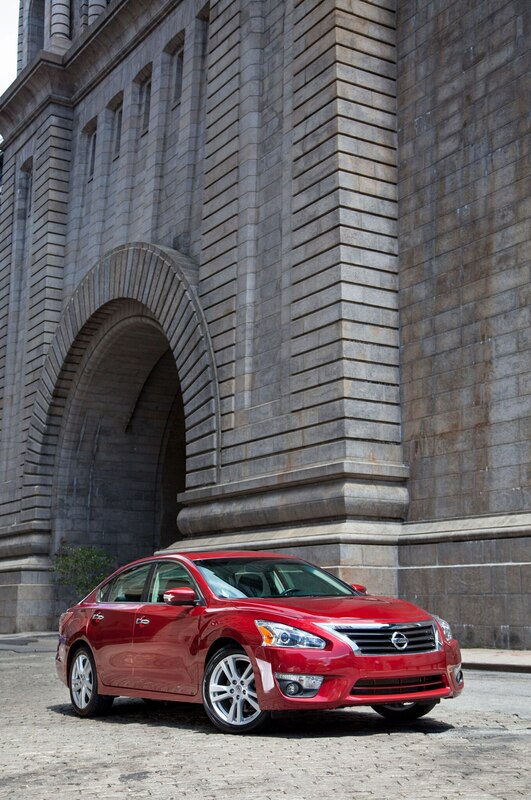 latest, fifth-generation Altima takes the familiar Nissan formula and improves the standard of execution with more stylish, luxuriously detailed bodywork, improved structural rigidity, lighter weight, refined suspension control, upgraded seating, a suite of active-safety features, and a comprehensive upgrade for electronic connectivity. One factor in cross-country comfort proved to be the big, puffy front chairs, which feature a seat design inspired by NASA’s profile of the position assumed by a relaxed human in zero gravity. The interior is spacious, notably in the rear, and Nissan has worked hard to muffle road noise. Meanwhile, the big center console is virtually an entertainment deck. In fact, Kalmar said, “I’ve never seen so many controls on a center stack.” Fortunately the layout is intuitive to use, the navigation says “please” when it gives you an instruction, and the Bose audio system delivers crisp, clear sound. 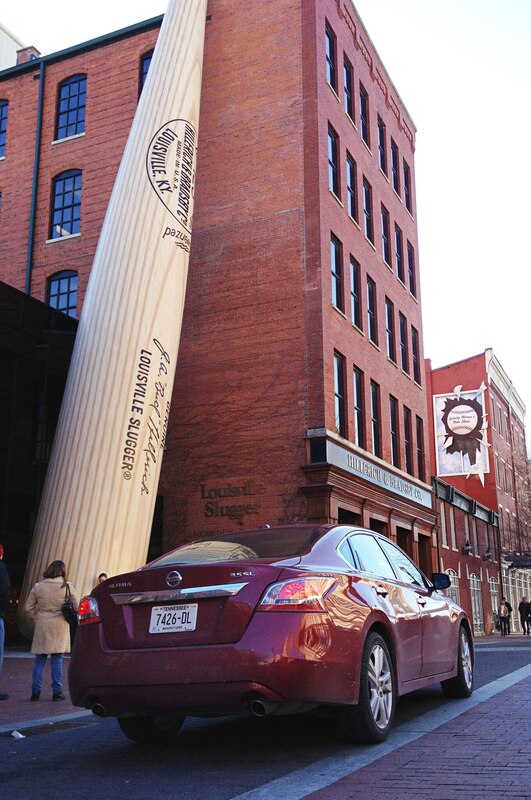 More than most cars, the Altima seems adapted to winter, which is serious business in real America. Its virtues were especially apparent to associate web editor Evan McCausland when he returned from a trip to Chicago by rail to find that five inches of new snow had fallen since he left the car in the Amtrak parking lot. After getting off the train, McCausland engaged the Altima’s remote start as he trudged to the car. He was pleased to see that by the time he’d loaded his luggage in the trunk, hot air was blasting from the defroster vents. Of such little miracles is a winter-friendly car made. Oh, and the steering wheel is heated, too. 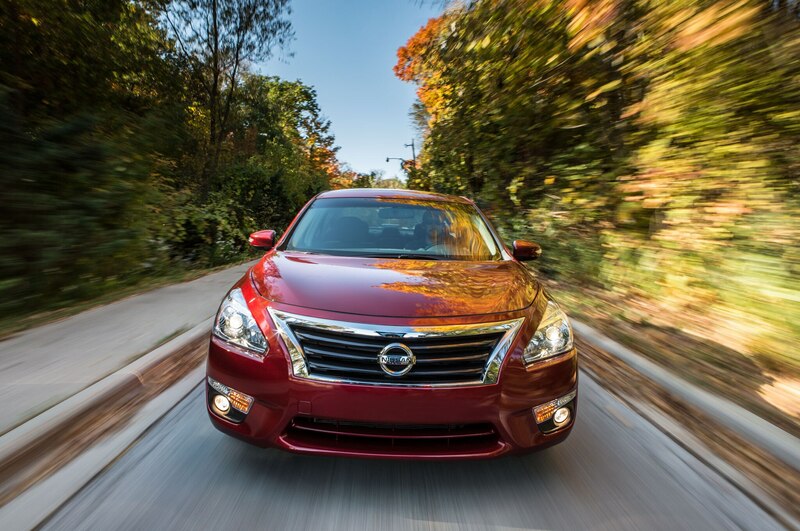 Fewer than ten percent of Altima buyers choose the V-6 model these days. As executive editor Todd Lassa says, “There’s something so 2007 about the whole idea of a V-6 in this market segment, especially since in this case it represents a 5-mpg sacrifice in city fuel economy compared with the four-cylinder.” Nevertheless, we loved the V-6 on the freeway, although we all found ourselves going about 20 mph too fast (especially DeMatio and senior web editor Phil Floraday, as always). The combination of the V-6 and a newly reengineered continuously variable transmission with 40 percent less internal friction helped us regularly achieve the advertised 31 mpg on the highway. Even Nelson admitted that, following one of his anti-CVT rants, his girlfriend looked blankly at him, said she thought all automatic transmissions were the same, and reported that she couldn’t feel any difference. For all the Altima’s set-it-and-forget-it personality on the expressway, we also could grow tired of such mindless motoring. The controls were numb, notably the electric-assist power steering, which lacked much instinct for straight-line travel, either because of the calibration of the electronics or perhaps the steering geometry. The Altima, with its relatively long wheelbase, has always rolled a lot in the front as it heeled around a corner, and while this strategy delivers cornering grip, it makes the car seem ponderous. 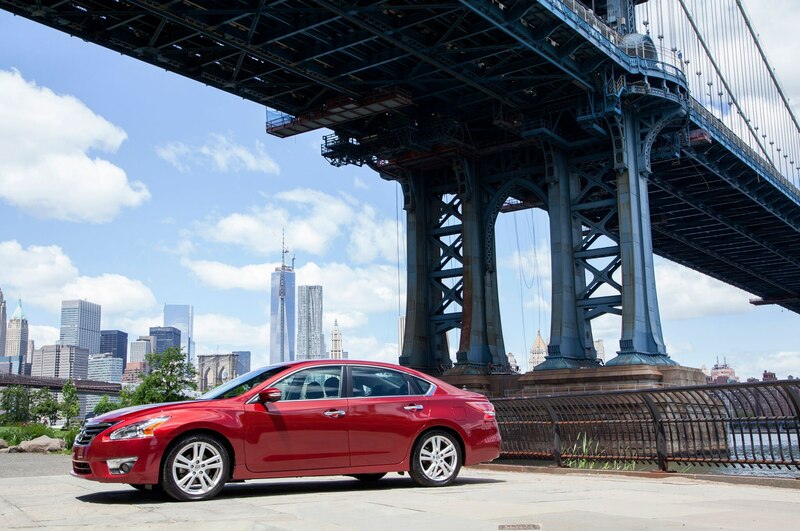 The Altima handles without a flaw — the stability control system and the rear suspension geometry work together to reduce understeer — yet the car never feels precise or responsive. And although the V-6 made our car a monster in the merging lane, senior editor Joe Lorio pointed out that it’s easy to spin the front tires while getting away from a stoplight (especially in the rain), probably from the combination of so much power, short initial gearing from the CVT, and the soft suspension setup. 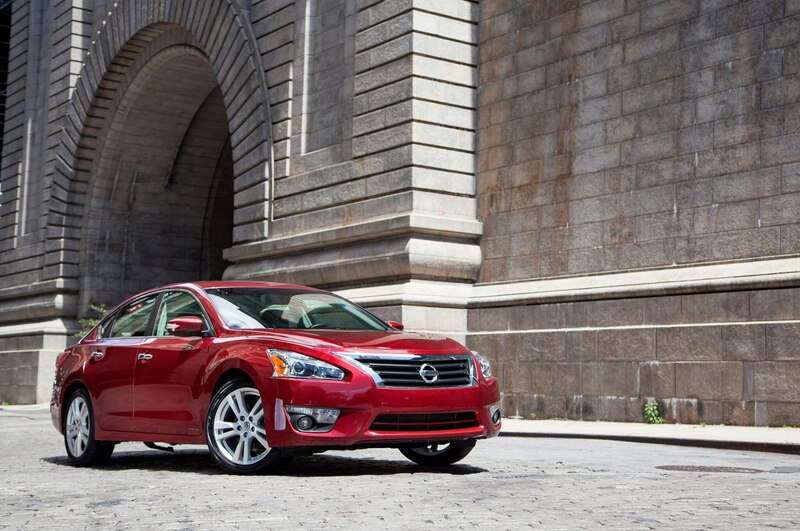 As with so many cars, the longer we drove the Altima V-6, the more we nitpicked the details. The Bluetooth didn’t seem to like us, as it sometimes distorted the sound, faded, or dropped out entirely, as if we were trapped in flip-phone hell circa 2003. 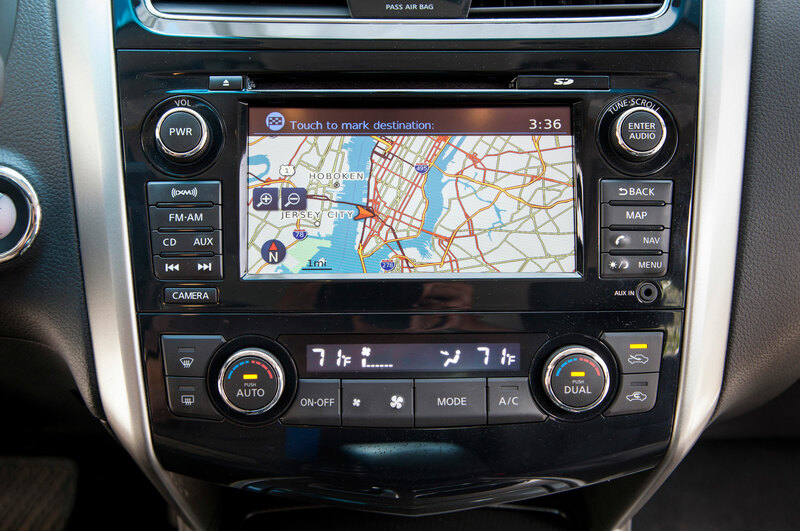 The affordable navigation system ($590 by itself) has a Google-compatible application through the NissanConnect software, but we never felt like we knew how to use it correctly. There’s an impressive suite of active-safety features, including blind-spot warning, lane-departure warning, and moving-object detection, but the system depends solely on the backup camera. The camera’s murky image (“rabbit-ear TV,” associate editor Greg Migliore calls it) suggests a low-tech approach that might be the reason we got so many false alarms. Running costs were minimal. The only visits we made to the dealer’s service department other than for routine maintenance were to adjust the seal for the whistling driver’s sideview mirror and to replace the humming right-rear wheel bearing. Both were covered under warranty. 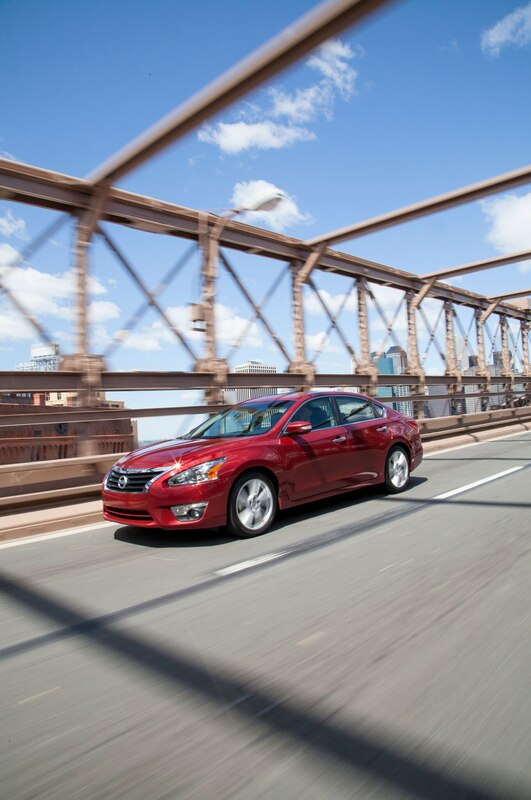 At the end of the year, the Altima proved a great freeway flyer, delivering on the promise it makes of fast, fuel-efficient, comfortable, and safe cross-country travel. It’s gratifying to see a car in the mid-size class that shows that its maker is putting money into the package, not stripping it out. Yet we were always on the verge of breaking up with this car, just because we need a stronger personality to keep us entertained. (“It’s not you, it’s me — honest.”) Robert Cumberford found the car “agreeable.” Jake Holmes called it “seriously inoffensive.” Nelson said it’s a “car-meleon,” blending in with traffic so you can fearlessly use the power of the V-6. Sometimes the Altima is an airliner on wheels; sometimes it’s just a Barcalounger on casters. In its category of affordable, practical mid-size cars, the Nissan Altima 3.5 SL is the one most like a luxury car, and the availability of so many features at a price of $32,135 seems like a lot of value. And if you were to tell your mother that you could regularly get the 26 mpg that we managed with our Altima over the course of a year, she would beam with approval. 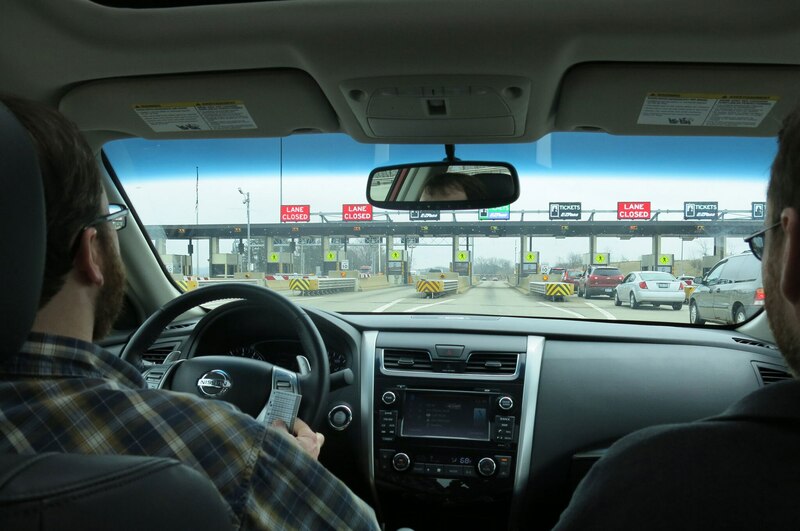 Probably it’s a sign of our staff’s deep-seated biases that only Brown — herself the responsible mother of four kids — truly embraced the Altima’s virtues, and it took her only a handful of miles on the road to Indiana to do so.